According to the Fast Lane blog, Secretary LaHood and Mayor Hickenlooper checked out a pair of bicycles and riding them to another station. See an article about the event in the Durango Herald. The DC and Arlington system with 1,100 bikes at 114 stations will launch in the fall. Gov. McDonnell will be discussing his plans to solve the transportation crisis by selling ABC stores and drilling for oil off the Virginia shore at a Fairfax town hall meeting on August 25. The location he chose for the meeting is probably one of the most inaccessible locations in the county unless you happen to drive, the Center of Innovative Technology. 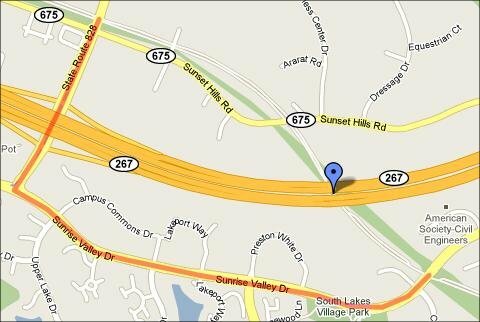 It's on the most western edge of the county bordered by the Dulles Toll Rd and Route 28. According to the WAMATA Trip Planner it's not served by public transportation. While I've never biked there, it seems pretty straightforward using Google Maps bike directions. What was he thinking? Was the meeting planned by the road lobby? From the Governor's press release, "I have consistently found that the best ideas don't come from Richmond, they come from Virginians in communities statewide. We are focused on reforming state government to make it simpler, smaller and more efficient. To best accomplish this goal we must hear from the citizens who own that government, and who deal with it on a daily basis. That's why we are launching the 'Virginia Speaks' statewide town hall tour. It's your government, and we want to know how we can make it work better for you." I guess he wants to hear from Virginians who drive. 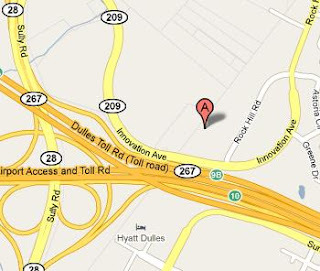 The meeting will be on August 25 from 7:00pm-8:30pm, CIT Auditorium, 2214 Rock Hill Road, Suite 300, Herndon. Why not show up and give the governor one of your best ideas about getting people out of cars and onto bikes. Due to construction of the Silver line, the Cross County Trail (CCT) is closed at the Dulles Toll Rd and Difficult Run. At this point the trail passes under the Toll Rd and is adjacent to Difficult Run. There is very little room to maneuver construction equipment under the existing Toll Rd bridge. The equipment is being used to build a new bridge for the Silver line track. There were plans to close the trail earlier this year. At that time we were told it would be closed until November. Since then there has been plenty of time for the county and the Metropolitan Washington Airports Authority (MWAA), which operates the Toll Rd and is constructing the Silver Line, to develop a detour. This is a heavily used trail that should never be closed without a detour. Would we close a major road with no options for motorists who travel on that road? As we noted in the earlier post about the closure, there is a possible detour that requires riding on the Beulah Rd bridge across the Toll Rd. As a commenter noted earlier, Beulah Rd is a heavily traveled road, and the bridge over the Toll Road is narrow with no trail or sidewalk. Only experienced cyclists should use this route. If you're headed north there is a dirt path leading from the CCT to Squaw Valley Dr. Take Squaw Valley Dr to L on Lozano Dr to L on Beulah Rd. Continue on Beulah Rd across the Toll Rd to L on Days Farm Dr just after the bridge. There are tennis courts located at the bottom of Days Farm Dr where a trail connects to the CCT. Map of possible detour. To comment on the lack of a detour at this location contact the Park Authority trails coordinator. You can also complain to MWAA. Update: MORE has a thread in their forum on riding the detour. About 12 cyclists turned out for the first ever (that we know of) Critical Manners/Mass ride in Vienna, or for that matter, in Fairfax County. Antoine McGrath put the ride together starting at The Soundry. Antoine lead the way, sound system/bubble maker in tow. The tunes and bubbles added a nice touch to the ride, which was very social, relatively slow, and fun. We rode along the W&OD Trail to reach Clarks Crossing Road and a climb up to Beulah Road and back to Maple Ave. We obeyed most traffic signals and didn't disrupt traffic too much, although one motorist couldn't be slowed for even a few seconds on Beulah Rd and insisted on blowing his (or her) horn for an extended period. Given there was a solid yellow line on our side and the lane was too narrow to share, it wasn't legal to pass anyway. From there we took a right on Maple Ave./Rt 123 and took over the outside lane. We were quite a sight, slowly cruising through Vienna, music blaring, bubbles flying, and curious motorists giving us plenty of room as the passed on the left. We had no problems as we made our way to Nutley Street and south to the Vienna Metro Station. We returned via a back route to/from the station through Nottaway Park and Tapawingo. After the ride a few folks returned to The Soundry, a nice little gathering place beside the W&OD Trail in an industrial strip development. Besides coffee and snacks there are several artists studios, a gallery, and a music space. The gallery will be the site of Biketastic!, a bicycle themed art exhibit opening next Saturday, July 31, as a benefit for Bikes for the World. Thanks to Antoine for putting the ride together. Watch for notices about future rides at the Critical Manners Facebook page. If you're up for a casual ride this evening check out the Critical manners ride leaving the Soundry in Vienna at 7pm. David Goodman presented a draft FY 2011 Pedestrian and Bicycle Programs Funding plan. The decal fee for vehicles will be increased by $8 to $36, and this money is dedicated for bicycle and pedestrian safety and infrastructure improvements. This earmarking of funds is unprecedented and equates to approximately $1 million - $600,000 for arterial improvements, $100,000 for technology enhancements (ped/bike counter, auto bike detectors), $100,000 wayfinding, and $200,000 for infrastructure/installation of bike sharing system. Sycamore – from Fairfax County line to Williamsburg Circle – is being resurfaced, paved and painted. This includes sharrows and bike lanes. Sharrows will be in the center of the lane. Construction of the Silver line at the W&OD Trail and the Dulles Toll Road has been underway for around a year. The work required replacement of the original trail, paving of the parallel unpaved trail, and a slight detour for cyclists. In my experience, and I pass through this location several times a week, construction crews working at the site have been very considerate of trail users. Fortunately the trail has remained open the entire time. That will soon change. Beginning in August, there will be intermittent closures of the trail at this location during construction of the rail bridge. According to the press release below, the trail will be closed for "approximately 15 minutes or less" for placement of steel girders. Work will also be done this Fall that will entail trail closures at night. We'll try to find out more details; this is a critical commuting route used by many cyclists at night. Yes, we know technically the trail is closed after dark but it's still used by many people to get back and forth to work. Intermittent Closures of W&OD Trail Expected Early August as Rail Bridge Construction Accelerates—The section of the Washington and Old Dominion (W&OD) Trail beneath the Dulles International Airport Access Highway and the Dulles Toll Road near Reston will be closed for short periods during several weeks in August. The closings are necessary because Dulles Corridor Metrorail Project construction crews will be ramping up work on the new bridge that will carry the rail tracks, which will run in the median of the airport and toll roads, over the trail. Crews have been working on the bridge for several months and trail users have encountered some detours. During the first week of August, crews will start site preparations for hanging and placing large steel girders on the ridge over the trail. The girder placements are currently scheduled to begin on or about Tuesday, Aug. 10. The steel girder erection work will be done during daytime hours because there are overhead power lines at this work site that would be difficult for workers to see at night. The trail will only close temporarily when the steel girders are lifted and installed. Closures are executed to last approximately 15 minutes or less for each girder. 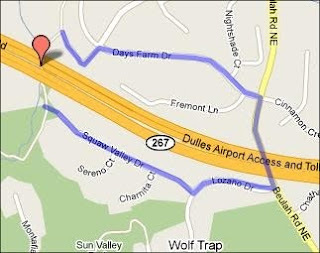 The affected section is located between Wiehle Avenue and Hunter Mill Road, where it crosses under the Dulles International Airport Access Highway (DIAAH) near the trail's mile marker 16. Because the future Metrorail line will run down the median of the DIAAH, this bridge is being built to support the tracks over the W&OD Trail. Drivers in this area may also experience lane closures along the airport highway when large equipment and materials are moved to that work area prior to the steel erections. All motorists and trail users should stay alert and use extreme caution while traveling through this area. After the erection work is completed, crews will be building the bridge itself. Most of that work will be done at night and will require full closures of the trail. A schedule will be released later this fall and the work is expected to be completed before Thanksgiving. Few kids today walk or bike to school. One consequence is that kids are getting less exercise than they used to. Instead of encouraging kids to bike to school we've built "kiss and ride" lots that encourages parents to drive their kids to school. The school system spends a great deal of money ensuring that kids either have a safe walking route or can take the bus, paid for by everyone whether they have kids or not. Parents still drive their kids to school. See our previous blog posts on this topic. USDOT Secretary of Transportation Ray LaHood understands that Transportation is a public health issue. He's trying to make sure that our transportation policies don't have a negative impact on our public health in part by ensuring that all modes are on an equal footing. Actions to foster motorized travel shouldn't negatively impact other modes. Here are a few quotes from his recent blog about a conference on this issue, "Keeping Kids Moving: "32% of children in the US are overweight or obese." and "This could be the first generation in America to live sicker and die younger than their parents." Some Vienna cyclists are planning a Critical Manners on Saturday, July 24 leaving at 7pm from the Soundry. Unlike Critical Mass rides, where cyclists tend to ignore all traffic rules, the Critical Manners ride will be mostly law-abiding with the goal being to have fun on bikes. 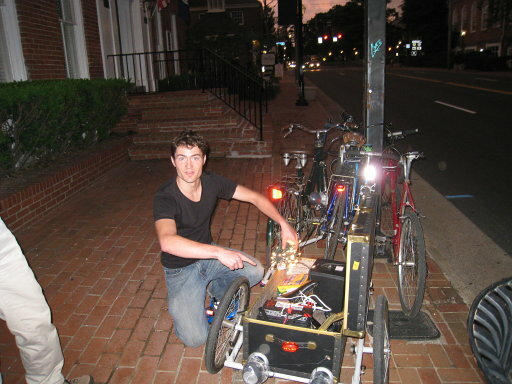 Antoine McGrath, who will be on the ride, is known to travel with his homemade boom-box trailer, which could add to the festive nature of the ride. The Soundry "is a former auto body shop that has been converted into a public coffee shop, art gallery, and shared studio space for our member artists and musicians." It is also the site of Biketastic!, a bicycle-themed art show. Planned for Saturday, July 31, Biketastic! is a fund-raiser for Bikes for the World. We often hear about bike crashes that occur and are never reported. This happens for a number of reasons. People may not think it's worth reporting or that police will not record the crash. They may not want to wait for the police to arrive or they've negotiated with the other person involved and don't feel a report is necessary. As a result, crashes reported to the police are only a small fraction of all bike crashes. We've been trying to meet with the police to discuss two recent bike crashes, on West Ox Road and on Sunrise Valley Dr in Reston. We've gotten very little information so far. We did have a short discussion with a public information officer. We also want to know who to contact in the future for information when there is a bike crash in the county. The discussion brought up the larger issue of how bike crashes are tracked. From what we can tell, a bike crash is only reported if there is property damage greater than $1,000 or there is a personal injury. In this situation, a driver must stop if this has occurred. There appears to be no threshold to the severity of the injury. According to the information officer, the crash reporting system may be able to handle all reported bike crashes. Besides asking for information about the two crashes, we've asked for a map of all bike crashes in the county in recent years. We're still waiting on both requests. Even with the map, we know that many crashes will go unreported. The Cascades Bicycle Club based in Seattle has developed an innovative online application for bicyclists to report crashes as well as road or trail hazards and bike thefts. It's called bikewise and the application works anywhere in the world. We plan to start using it on a test basis. If you'd like to do the same, visit the bikewise site and report any appropriate incidents. Cyclists in Arlington and DC have already begun using it. In 2009 FABB received a grant from the Alliance for Biking & Walking to produce a bicycle advocates guide to the road design process (see the Alliance for Biking & Walking press release). Over the past year Fionnuala Quinn and other FABB members have been researching the topic, meeting with state and local transportation officials, and putting together the guide. The final version of the guide was printed last week and is now available, both in printed form and online. An HTML version will be available soon. Download a high res version (18MB) or low res version (6MB) of the guide. Reston, VA, July 14, 2010 - Virginia bicycling advocates have a new resource to help them review and comment on public road projects. The new guide, prepared by Fairfax Advocates for Better Bicycling (FABB) in consultation with the Virginia (VDOT) and Fairfax County departments of transportation, outlines ways bicycling proponents can get involved in the process of designing, approving, building, and retrofitting roads to ensure that bicycling accommodations are integrated into the plans where needed. Although geared for Virginia, many of the ideas contained in the report could be applied to other locations as well. As described in the guide, planning, approving, and constructing road projects is a long process that presents many opportunities for bicycling advocates to provide input into the final outcome. Readers will find helpful tips for speaking at public hearings and meeting with engineers. The easy to read booklet covers the basics of understanding engineering plans and also outlines various roadway features (such as intersections, roundabouts, wide curb lanes, and bike lanes) that could be shown in the plans. Design standards and guidelines, design and safety issues, and a checklist for each of these features help advocates review and comment on road design plans. "As far as we know, no one has compiled material like this before," said Fionnuala Quinn, primary author of the guide. "I wanted to use my background in civil engineering to help demystify the road design process and to help people take advantage of occasions to incorporate bike facilities whenever roads projects are being designed. A crucial point to remember is that the earlier you provide input to the road design, the better your chances of having an effect on the final design. Besides the printed version of the report, we also plan to have an online version on the FABB web site that contains links to additional information." Funding for the report came from an Advocacy Advance Grant from the Alliance for Biking & Walking. Funding for the grant was provided by SRAM, Planet Bike, Bikes Belong Coalition, and 42BELOW. Additional funding was received from the IEEE. The report "Guide for Reviewing Public Road Design and Bicycling Accommodations for Virginia Bicycle Advocates," by Fionnuala Quinn and Bruce Wright, will be provided to major bicycle organizations in Virginia and to the Alliance for Biking & Walking. Copies are available free of charge upon request to finnbike [at] gmail.com or can be downloaded from www.fabb-bikes.org. For more information on the guide, contact Fionnuala Quinn, finnbike@gmail.com, or Bruce Wright, chairman [at] fabb-bikes.org, 703-328-9619. FABB is a grassroots initiative in Fairfax County, VA, affiliated with the Washington Area Bicyclist Association (WABA), aiming to make bicycling an integral part of Fairfax County's transportation network. Visit us on the web at www.fabb-bikes.org. 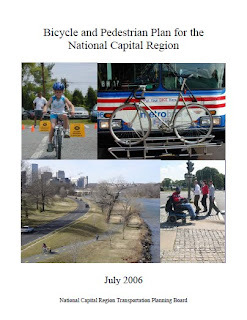 The Bicycle and Pedestrian Subcommittee of the Metropolitan Washington Council of Governments is in the process of updating the 2006 Regional Bicycle and Pedestrian Plan. This Bicycle and Pedestrian Plan for the National Capital Region identifies the capital improvements, studies, actions, and strategies that the region proposes to carry out by 2035 for major bicycle and pedestrian facilities. This plan is an update to the 2006 Bicycle and Pedestrian Plan for the National Capital Region, which was the first all-new regional plan specifically for bicycle facilities since 1995, and the first-ever regional pedestrian facilities plan. The Bicycle and Pedestrian Plan for the National Capital Region is intended to be advisory to the CLRP and TIP, and to stand as a resource for planners and the public. In contrast to the CLRP, the Bicycle and Pedestrian Plan includes both funded and unfunded projects – projects in this plan may not yet have funding identified to support their implementation. We haven't had a chance to review the plan yet. If you would like to comment on the plan you can visit the Draft 2010 Bicycle and Pedestrian Plan blog and post comments there. The CLRP bike projects list is being updated. The projects listed in Fairfax County are woefully out of date. We understand county and VDOT staff are in the process of updating this list. We'd like to see some on-road bike facilities listed. This is yet another reason for completing a county bicycle master plan. The 2035 Virginia Surface Transportation Plan (VSTP) is Virginia's long range plan for all modes of transportation, including bicycling. Fairfax County is in the Northern Region. The draft plan is now available for review and comment until July 30. The Bicycle and Pedestrian Element of the plan is focused on: Development of a Bike Policy Plan, Development of a Pedestrian Policy Plan, and Development of an Implementation Plan for both the Bicycle and Pedestrian Policy Plans. The Bike Policy Plan is still in draft form, and now that the statewide bicycle coordinator position is vacant, progress on completing the plan is slow. Even when complete, the bicycle policy plan will contain few concrete facility recommendations. It is a policy plan that addresses VDOT policies, programs, outreach, and data collection. The following recommendations are suggested: Bicycle improvements to existing roads, especially U. S. Bicycle Routes 1 & 76, such as paved shoulders or restriping for wide curb lanes or bike lanes; construction of new regionally significant bicycle facilities; improved maintenance of bicycle facilities; and improved bicycle access to park and ride facilities, including better bicycle parking at those facilities. A plan for funding these improvements should also be included. See the 2035 Virginia Surface Transportation Plan. At their November 19, 2009 meeting the Commonwealth Transportation Board (CTB) voted to adopt a new policy regarding the use of Transportation Enhancement funds. Instead of using funds for many non-transportation related projects, they would "Apply any funding for new projects to those that promote core transportation functions." Now Governor McDonnell wants to use these funds for tourist and welcome centers: "Regional Tourism and Welcome Center Partnership - Use transportation enhancement grants to further tourism outreach through the establishment of partnerships between tourism entities along Virginia's interstates. These grants will be used to develop scenic/historic highway programs such as locating commercial regional tourist/welcome centers at interchanges." Today I read that Governor McDonnell is proposing to use Transportation Enhancement funds "...to further tourism outreach through the establishment of partnerships between tourism entities along Virginia's interstates. These grants will be used to develop scenic/historic highway programs such as locating commercial regional tourist/welcome centers at interchanges." I know that the CTB recently approved a policy to "Apply any funding for new projects to those that promote core transportation functions." To my knowledge, tourist/welcome centers were not included in that definition. Since enhancement funds play a critical role in developing bicycle and pedestrian infrastructure, it would be unfortunate if these funds are diverted to funding other non-core transportation projects. I urge you to continue to fund much needed bicycle and facility projects that play an important role in solving our congestion and air quality problems and lead to healthier Virginians. 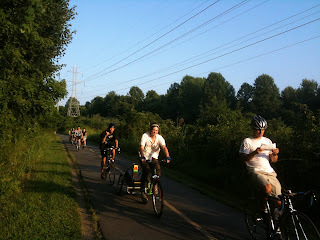 This week we decided to try riding the Reston Bike Club Wednesday social ride. The rides leave from the public parking lot adjacent to the W&OD Trail across from the caboose in downtown Herndon at 6pm. We rode over from Reston on the bikes we use for most of our riding. Everyone else on the ride drove to the start with the bikes on their car. Our bikes have panniers and fenders and we use them for transportation. We carry stuff and we ride in all weather conditions. The bikes received some interesting reactions from some of the riders, most of whom had carbon road bikes. "What kind of bikes are those?" It's surprising how many people use bikes only for recreation. 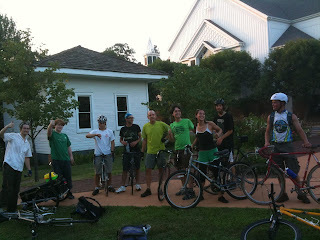 As you would expect, the pace of the social rides is slower than most of the club rides although we moved right along. In any group ride it's almost impossible for the group not to get spread out, and while we planned to ride at the pace of the slowest rider, we still had to stop occasionally to regroup. It's also almost impossible for the group to stop at all stop signs. Like motorists, we rolled through many of the stop signs when no one else was at the intersection, although some of us at least made an effort to slow down. It was an enjoyable ride; a little faster than we expected but we had a good time and discovered some new roads in the Ashburn area. We spent too much time on the trail but the route varies depending on the composition of the group and the trail is avoided when possible.